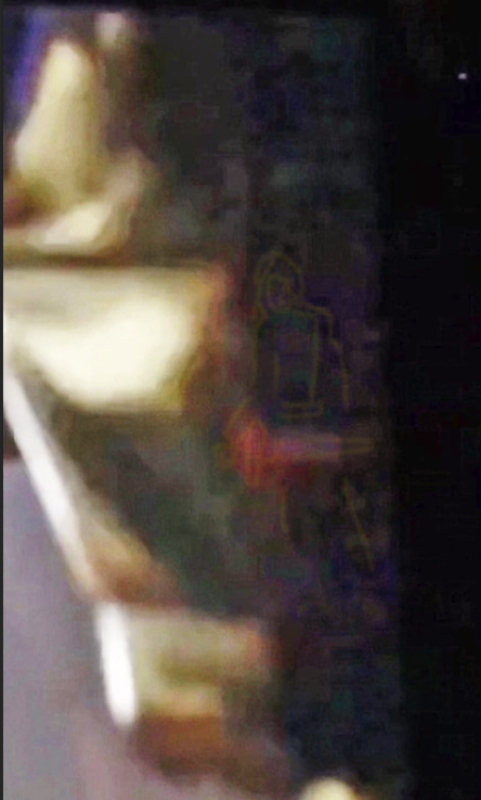 Thought I'd let everyone know that JediPaxis's leak for the Mandalorian was verified today with the footage from SWC. More confirmation for the Oracle info. I commented about it, when I posted the gif of this scene. I had a feeling that red was his lightsaber. Do we know which scene Jason was talking about where he said Rey and Kylo come face to face for the first time since TLJ? Because this one is most likely the first act of the film when they take the group adventure to the Jordan based planet. I'm wondering if the scene we see in the trailer may be from what Jason believes is this big fight between Rey and Kylo where they move through the force in different places. I noticed that red light too but was afraid to post... I mean it could be some kind of light like from droid or panel. I'm always seeing things in shadows. omg!!! Excellent catch! I just realized they are in a cave. I wonder when Kylo comes to the desert he's already told her he's coming to switch sides, similar to how Rey went to Kylo in TLJ and he was expecting her. Would explain why Rey is internally freaking out and not sure what to expect. I remember when we [the forum as a whole] were trying to figure out the timeline of TLJ. Looks like we're on this train again! And this will be the last time we do this together. does anyone know if we're getting a Vanity Fair photoshoot in May or June (or before IX premieres)? I sure hope so! There will be a mourning period as all of this comes to an end and we go through the motions one last time, but it was all really worth it for me and incredibly validating for women just trying to have a voice in a male-dominated fandom. Even if it has to come to an end after this film I'm sure it'll be a memorable 4-5 years for all of us. We've come so far. Apparently, Annie Leibovitz was in Jordan for a photo shoot according to MSW. Will they do several covers like TLJ (including a Reylo one! ), or a single all-cast picture? Either would seem appropriate. @FrolickingFizzgig wrote: There will be a mourning period as all of this comes to an end and we go through the motions one last time, but it was all really worth it for me and incredibly validating for women just trying to have a voice in a male-dominated fandom. Even if it has to come to an end after this film I'm sure it'll be a memorable 4-5 years for all of us. We've come so far. I think for me, just because Star Wars's Skywalker trilogy is coming to a close does not mean I'm about to bugger off lol. Absolutely if it wasn't for Reylo I would not be here, but here's the thing... I came for Reylo. I stayed for the Reylo Fandom. And man, if we win big in this next one I don't see us stopping for a while. After all, its a story for the ages right? I for sure have become a lifetime Star Wars fan because of this. What a ride. You guys are awesome. But more on topic, I think the glint on 3PO might just be a camera light. There are tons of different "on" lights for film cameras. I think it might be that. I don't know... that could just as easily be a sight from a stormtrooper blaster..
it could be slightly elongated because of the motion from C3PO's head. might be Kylo's lightsaber.. but might not be..
Looks like kylo's form and lightsaber with cross guards to me! And not only their facial expressions, but also the way Poe and Finn are huddled really closely to Rey, defensively, makes me think they're encountering Kylo. exact. Their expressions speak for themselves. in addition, Rey has his lightsaber on, a clear sign that there is a danger near them. Also in the background we see a rock. Surely it is the planet of the desert and in the trailer we know that there is the trio and Kylo. 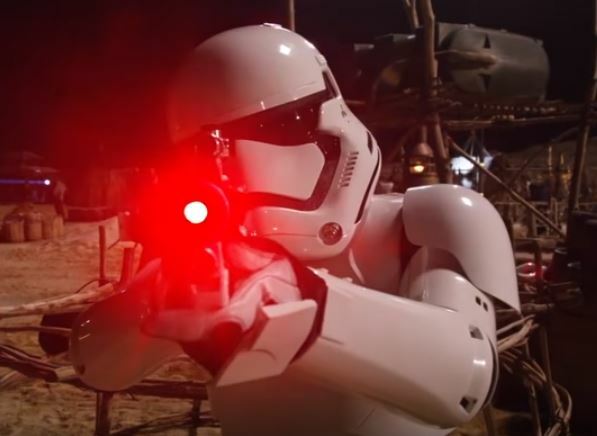 It isn't Stormtrooper Blaster cause Rey wouldn't have lightsaber up. They are dealing with Kylo and Finn and Poe wouldn't look so on guard with rey looking softer if it was just some storm trooper. C'mon. we know he's there. @spacebaby45678 wrote: Spoiler? Logical conclusion? Tie Silencer was clearly made for one person, I wonder if the new ship has more space inside for at least two people?